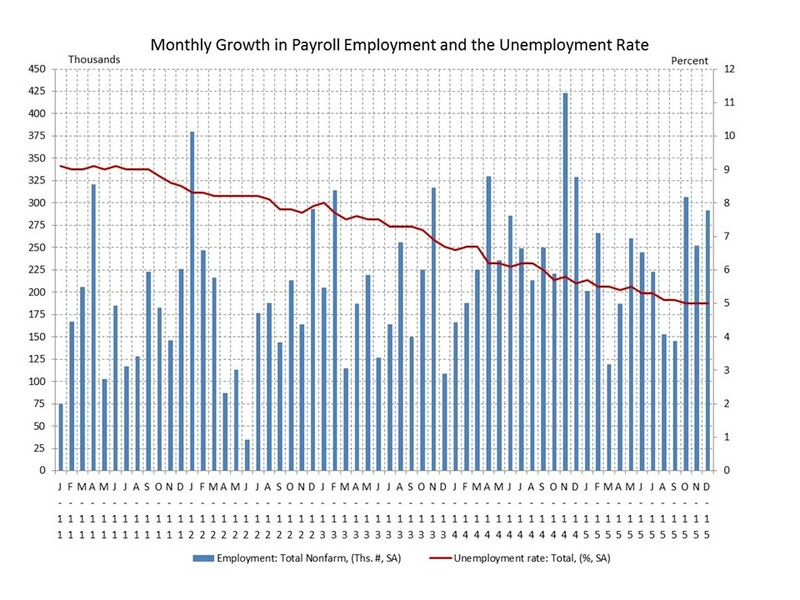 The Bureau of Labor Statistics (BLS) reported payroll employment expanded by 292 thousand in December and revisions added 50 thousand to estimates for the prior two months. The household survey showed strong gains in both the labor force (466 thousand) and persons employed (485 thousand). The unemployment rate held steady at 5.0%. Three consecutive months of strong gains in both employment and the labor force are encouraging signals in the labor market. Other labor market indicators moved in opposite directions in December but have trended down over the year; part-time workers for economic reasons ticked down, while workers marginally attached to the labor force ticked up. The pace of wage increases has been inching up over the year but caution is warranted. Continued strong job gains and a low unemployment rate should support further wage growth. But the pace of the thinning of the hidden labor supply will also be a factor. The fastest wage growth we’ve seen in past cycles has come when the unemployment rates moves below 5.0%, but in those periods the levels of part-time and marginally attached workers was significantly lower. Bringing those workers back and back up to speed may act as a hidden brake on more robust wage gains. The problem with this statistic is it says nothing about the actual quality of all this “new” employment. Unemployment may be going down, but if the new jobs are low paying, part time positions, is it really all that much to celebrate? No one wants to talk about that though, and would rather just trumpet the unemployment percentage.